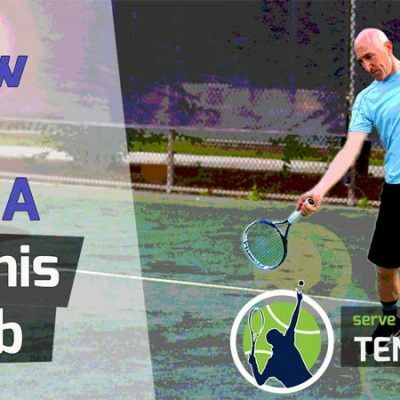 Are you looking to add the serve and volley game to your tennis arsenal? Or maybe you currently serve and volley but just want some tips to improve that part of your game. 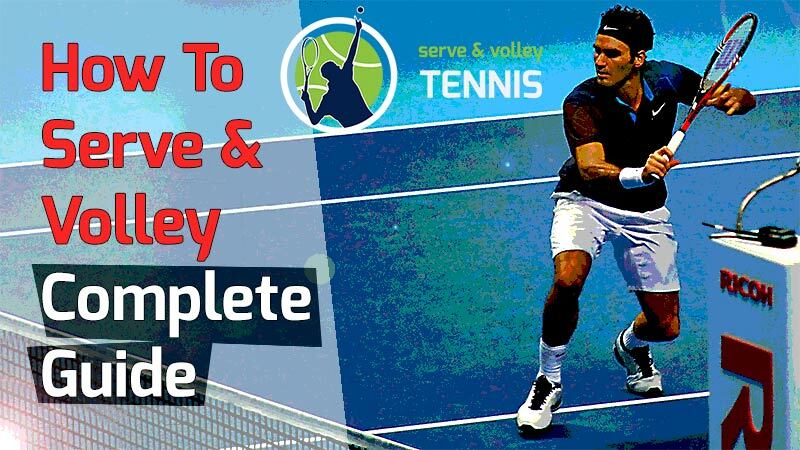 This post is all about how to effectively serve and volley in singles. Some of the information here will work well for doubles, but we’re going to focus primarily on singles. In order to serve and volley effectively, it’s essential to have a serve with spin and pace that can be placed accurately. It also requires solid volley technique and the ability to hit overheads. 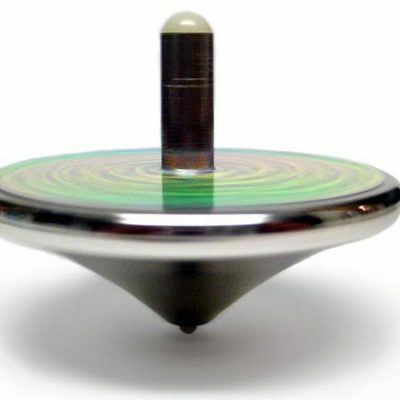 Finally, it requires athleticism, good hand-eye coordination and the right strategy. We talk a lot about the serve and volley game on this blog, hence the name of it. 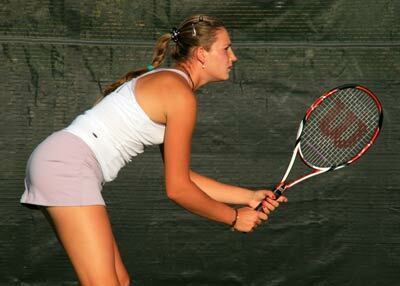 I am a big proponent of the serve and volley style and I use it in singles and doubles matches consistently. It’s very effective against players slightly lower in level and a good way to change things up when facing players your level and above. 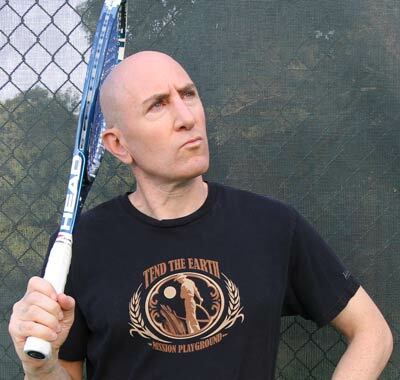 Like most players, I started off as a baseliner who added the serve and volley game later on. While pro tennis has proved (at least for now) that serve and volley is not as effective as the baseline game, it’s still very effective at the club level. I believe you should be using the serve and volley in doubles, and if you have the ability, it can work wonders for your singles game as well. Keep in mind that it takes years to build up a good serve and volley game, so give it some time. Let’s face it. You absolutely need a good serve with spin, speed and placement to use the serve and volley as a weapon. If you don’t have a good serve, you’ll be a sitting duck at the net – even at the club level. A poor serve with little pace and spin means players are going to pass you, hit to your feet and lob you. You’ll eventually get frustrated, abandon the serve and volley game, and retreat to the comfortable confines of the baseline. 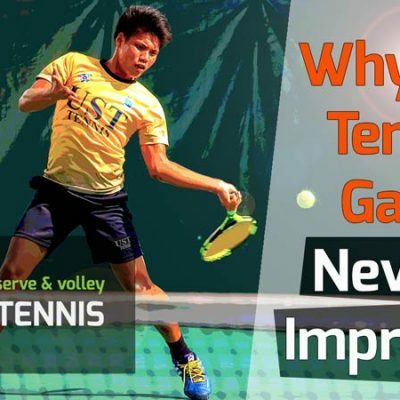 If your serve is weak, you’ll need to improve it if you want to consider adding the serve and volley game to your tennis arsenal. How much you need to improve your serve is really for you to judge. I’ve seen players with 70 mph first serves come in and volley effectively because they’re playing at a 3.0-3.5 level. If you play at that level, you can get away with a subpar serve. At the 4.0 level and above, probably not. If you wonder about the level of your serve, here is a simple way to tell if you can use it to serve and volley. Try to serve and volley on every first serve for a whole set against someone at your level. If you get passed every other shot and lose most of the points you come in, then you need work on your serve. 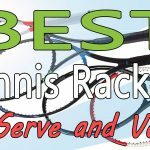 If you want to take your serve to the next level, we have articles like this (basic), this (2nd serve) and this (serve toss), and also videos showing you how to serve. Take a look at our youtube channel. 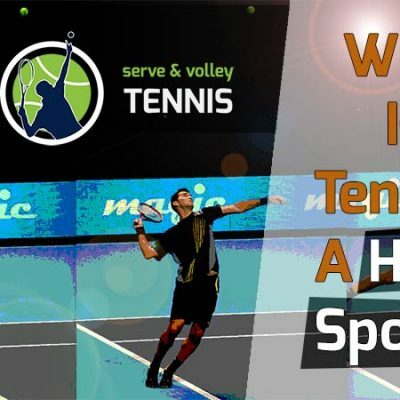 This post is intended to provide you with strategies to serve and volley effectively. It assumes you have the ability to hit good serves and decent volleys at your level of play. Choosing the type of serve. Choosing a target for your serve. How to approach the net. How to meet the return at the net. Choosing the type of volley to hit. Choosing a target for our first volley. Considerations when serving to the ad side. Chip and Charge: a strategy for the receiver. Flat serve – This is your fastest serve which has little spin. 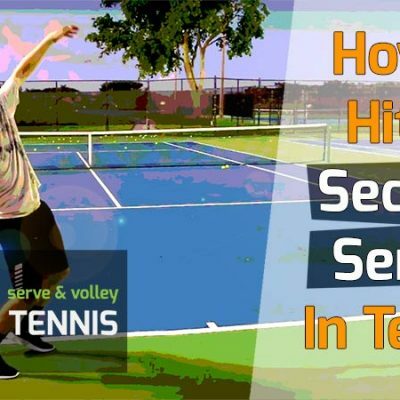 Kick serve – Your topspin serve, which “kicks” or bounces high off the court. Slice serve – This serve has side spin and usually stays low and spins in the opposite direction of your hitting arm. There is a difference between a kick serve and a slice serve. 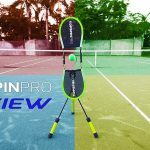 A kick serve has topspin, which makes the ball “kick” or bounce high in the air after hitting the ground. This serve can be very difficult to return, especially to the backhand of your opponent. A slice serve has side spin and usually stays low and spins to the left (if you’re a righty) and vice-versa if you’re a lefty. This serve can also be very effective because it can slide away from the returner – or even directly into them. Your opponent will always be left guessing which serve (flat, kick, slice) you will be serving. It will disrupt the return game of your opponent. A kick serve and flat serve can vary in speed by as much as 30-40 mph. These extremes make it difficult for your opponent to time your serve. After hitting all three serve types, you can assess which one your opponent has the most trouble with and key in on it. For example, maybe the flat serve into the body on the deuce court is problematic for your opponent while the kick serve to the backhand gives them trouble on the ad side. You can determine this as the match progresses. This is a good way to figure out players you have never previously faced. When serving to the deuce side, you should be aiming for one of three specific targets or zones on the baseline. Take a look at the diagram here for a visual. Imagine the baseline of the deuce side is divided into three equal widths. The three different targets are out wide, into the body, and up the middle. When using the serve and volley, you should know the answer to two questions before you toss the ball. First, will the serve be flat, kick or slice? Second, which zone will you aim for? You should definitely be mixing up the serves and zones. Take note during the match which zone gives your opponent the most difficulty. You can then hit to that zone during important points, like break and ad points. You would also want to hit a majority of your serves to that zone, perhaps 50-60% with the other 40-50% split between the other two zones. Now let’s talk specifically about serving to each zone. For the sake of brevity, the following information assumes a righty is serving to a righty. Obviously, this information will change if a lefty is involved. Serving Out Wide – This can be a very rewarding serve. If you can hit a wide enough angle, you can secure an ace. At the least, you can force your opponent to return way off the court. This usually results in a weak return that you can put away at the net. It’s best to volley the return to the opposite side of the court (ad side) when your opponent is so wide. Anyone of the three serves, flat, kick or slice, will work when serving out wide. The danger in serving out wide is that if you don’t hit a good angle, you are serving right into your opponent’s strength: their forehand. Your opponent can then rip a return in which they can pass you down-the-line or cross court. So make sure to aim near the line when going out wide. Into The Body – This is the safest and highest percentage serve but your chance of securing an ace is almost zero. You’ll want to hit a fast, flat serve directly at your opponent. If done right, your opponent will not be able to return the serve to your side of the court. Or, at the least, you’ll get a weak return that can be put away easily. If you try to hit a kick or slice serve to this zone, your opponent may be able to move out of the way and blast a return. Likewise, if your serve does not have enough pace, your opponent can do the same. So make sure you have some zing on your serve when going into the body. 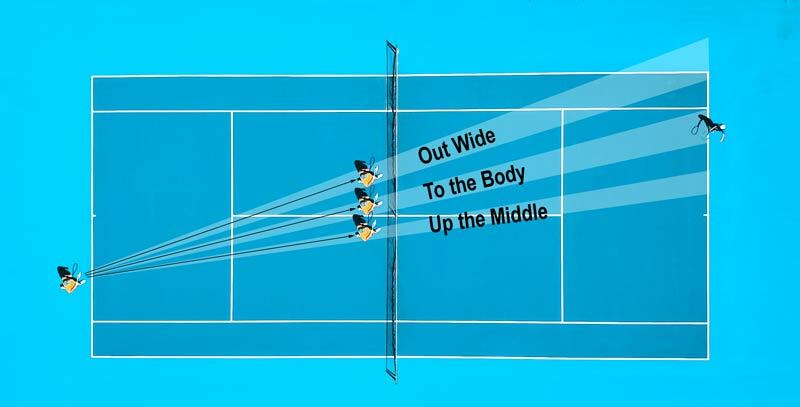 Up The Middle – You’ll probably use your fast, flat serve here most of the time. A kick serve can also work very well (if it has enough pace). And a slice serve can be effective up the middle too, as it would slide into the body of your opponent. What I like about going up the middle on a righty is that the ball is directed into their backhand, which for 90% of club players is their weaker wing. You can definitely hit an ace on a good up the middle serve. Or, if you can kick the ball up high to the backhand, you’ll most likely receive back a weak return. Personally, I feel targeting a serve up the middle is the most difficult spot to hit for a right-handed server at the club level on the deuce side. Still, you should be targeting this area. What Happens After The Serve? You’ve chosen one of the three different serve types (flat, kick or slice) and selected a zone (out wide, into the body, out wide). You then step up to the line and hit a great serve. Now what? 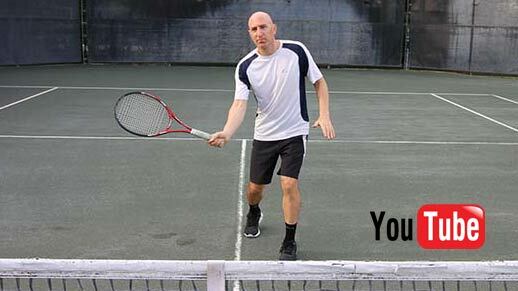 As most of you already know if you play tennis, you’re going to run forward toward the net. It’s called “following the ball”. When done right, the serve and volley is one blended motion. It consists of the serve, landing on the left foot after the ball is struck and running in. This part of the serve and volley should be seamless and quick. Your footwork here is essential. Without good footwork, you’ll never get close enough to the service line to stick your first volley. I therefore want to mention a couple of important points about it before we move on. Almost all right-handed players will want to land on their left foot after serving. This holds true for any and all types of serve by righties. By landing on your left foot, you’ll thrust your weight forward which makes for a bigger serve. You’re also creating forward momentum that will propel you towards the net. 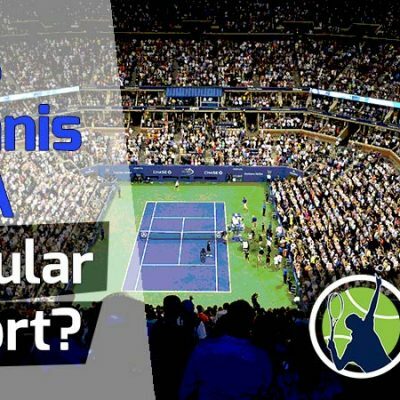 Take a look at any right-handed player on the ATP or WTA tour. You’ll see all of them land on their left foot when serving. Once you land on your left foot, your upper body should be slightly over your left leg, which will cause you to “fall” forward. You want to use this forward movement to take your first step with your right leg. You then run toward the net as quickly as possible. An important key here is to stay slightly lower on your run than you normally would. This means arching your back slightly forward, maybe 10 degrees. By doing so, you get to net quicker and split-step easier. We know we will come to net after the serve. But what’s the best path to come to the net? When the serve is performed correctly, our momentum takes us forward into the court. So where do we go from here? The rule of thumb for almost all serve and volley points is to follow the path of the ball. The wider the serve on the deuce side, the sharper our angle of approach. See the diagrams I included above for a good visual description of how to approach each zone. If we are going into the body, then we run at a less sharp angle. Since the serve is being directed into the body, our opponent will not be able to hit down the line as easily as when we go out wide. We can, therefore, approach further from the line, covering more of the middle of the court. But what if we serve up the middle? Again, we follow the path of the ball. Our line of approach will be at a very slight angle, running almost up the middle of the court. If you hit a well-struck serve to your opponent’s backhand (which will happen if you hit this zone), you should receive a weak return, ripe for a put-away. Be careful though. If your opponent has time they can pass you in either direction. It’s much more likely they pass you by hitting to your ad court (left side of your court) than to the deuce side (to the right of you). This is because hitting a good, inside-out backhand on a return is difficult – plus you are approaching from the deuce side. When you see your opponent go into their backswing for the return, you’ll want to stop and split step. The stop is not abrupt though. That would be inefficient and will never work in a real-world scenario. Instead, it involves a hop. At first, it may seem challenging to do, but after some practice, it becomes second nature. As your opponent goes into their backswing, you’ll literally hop off one leg (I like to hop off my left) and “jump” into the split step. I see so many club players miss doing the hop, which causes them to split step a little too far from the net. Just a foot or two difference from the net can mean hitting a volley off the ground (half volley), which is not preferable, or catching it in the air (preferable). The hop allows you to cover more distance and spring forward out of the split step easier. What exactly is the split step? The split step occurs when you come to a full stop with both feet directly under you, slightly wider than shoulder width. 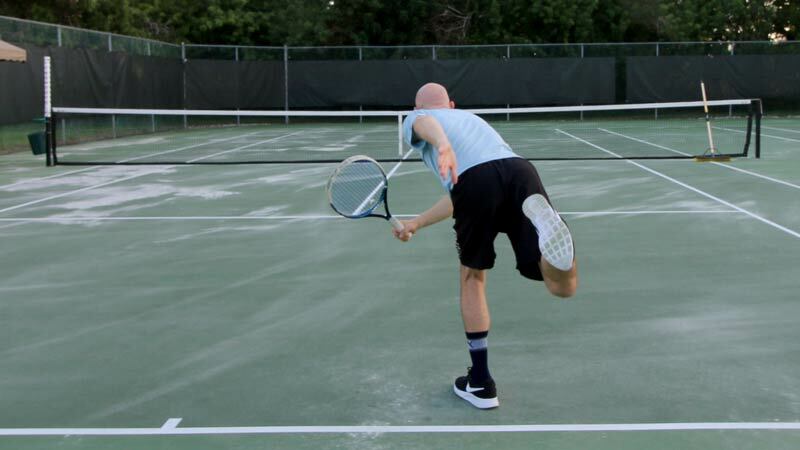 The split step is used by professional players everywhere on the court, but when close to the net, you’ll want to adopt a wider than normal stance and get slightly lower. This allows you to push off in any direction quicker. When approaching the net after the serve, keep the racquet in front of you and maintain the continental grip (like gripping a hammer). I like to keep the racquet in a neutral position about chest high. A neutral position means it will take the same amount of time to hit a forehand volley as it does a backhand volley. 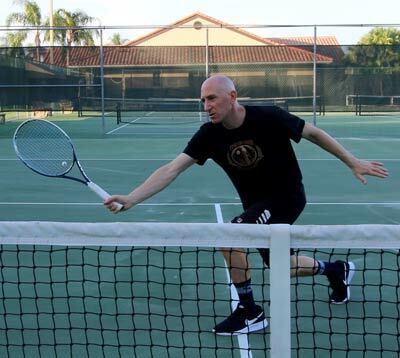 I see way too many players run with the racquet on one side of their body, which makes it nearly impossible to volley a high-velocity return on the other side. You should also keep the racquet head slightly higher than the hands. This will set you up to volley in the correct position. 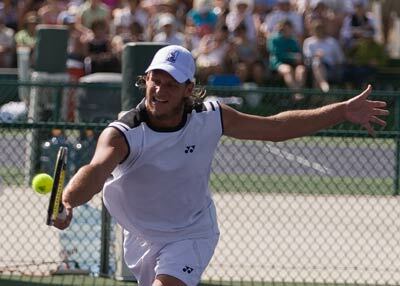 In tennis, there are very few black and white protocols, such as always do this and never do that. Some players ask me where they should follow through on their forehands. The answer is that it depends and varies on the situation. The same is true of the split step. Most of the time you’ll split step in the manner I described above. But sometimes you’ll want to keep running and not hop or split step. This is called the flowing volley and it requires more hand-eye coordination and timing. We can define the flowing volley as hitting a volley while still moving forward. You’ll want to incorporate the flowing volley in your game, even though it is more of an advanced way to approach the net. Here’s how to do it. Simply continue to run forward but slow down some to hit the volley. Only after the ball is struck will you stop. It’s important you start setting up the racket before you get to the ball. When is the best time to use the flowing volley? I’ll outline them below. The return is hit so slow that you don’t need to split step. Instead, you continue to run towards the ball and use a drive volley to put it away. In some instances, you can hit a swinging volley. You can also employ a drop volley. If you want to know about the seven volley types, you can read an entire article we wrote on the subject here. If you see the ball starting to drop low, you may want to continue running to take it out of the air. This is usually the case on soft-to-medium hit returns. On hard hit returns to your far right or left, it’s not advisable to use the flowing volley. If you don’t have enough time to move up to the service line, you may want to sacrifice the split step to get closer and better position. This is a gamble though. If the return is hard hit or is near the lines, you’re in trouble. But if the return is medium pace, or even fast pace but directly to you, you can still recover and hit back a defensive or decent volley. On a slow-paced return, you should have no problem adjusting. You serve, hit your zone, and your opponent returns at a medium pace right to your direction. Whether you split step or not, you have a great chance to hit a good first volley. So which type of volley do you hit? And where do you place the volley? We will define four targets for the first volley. The target you choose is dependent on where your opponent and yourself are on the court. Additionally, the speed and height of the return will determine the volley response. One more quick word on the first volley. While our goal is to always hit an unreturnable first volley and win the point outright, we need to be prepared to hit a second volley. It might be better to think about your first volley as a shot that sets up the second volley. This will take some pressure off your first volley. Remember, whether it takes one volley or five volleys, if you win the point, then goal accomplished. Which Volley Do I Hit? I wrote a long and detailed article with photos showing the seven different volley types. I won’t repeat the information again here, but I will touch on which volleys to use and when. If you don’t know the seven different volley types, I highly recommend reading that post. It will be very helpful to your volley game. 1. Drive Volley – Use this volley on slow-hit shots. It’s vital you use the drive volley to decisively put away slow. If not, the point is likely to continue and the chances of you being passed increase. You can always tell if you’re playing against an expert volley player by how easily or not he puts away sitters. The greats do it 9 out of 10 times and often the returner will have no chance to even get a racket on the ball. 2. 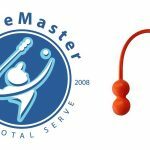 Swinging Volley – I like to use the swinging volley when I get a looping shot with little pace. Usually, the shot will be too low to hit an overhead smash, so I set up for a swinging forehand volley. The swinging volley should easily end the point and has a bit more power than the drive volley. I don’t recommend hitting a backhand swinging volley to beginner and intermediate players, but if you can manage it, then go for it. 3. Punch Volley – Hit this volley when you receive a medium-paced return. All we’re doing is blocking with a little “punch” or forward movement of our racket. Optionally, you can step forward with the opposite leg when volleying to give the ball some pace. 4. Block Volley – Use this volley when your opponent hits a screaming groundstroke in your direction. With this volley, you’re just blocking or deflecting the ball to your opponent’s side of the court. Make sure to hold the racket with a loose grip and allow it to have some give when impact is made (how much will depend on how far you’re volleying from the net). I see many club players make the mistake of trying to hit a punch volley on high-paced returns. Sometimes the less you do, the more you accomplish. The same is true for the volley – less movement and take back is often better. 5. Half Volley – If you serve and volley a lot, you’re going to be forced into half volleys on many occasions. A half volley is when the ball hits the ground before you volley it. Since half volleys are generally defensive shots (though they can be turned into offense as well), your first goal is to get the shot back and over the net. Most of the time you’ll be volleying up and directly off the rise. If you feel like you have a good chance of returning the half volley, your best bet is to just place it well. Don’t worry about hitting it hard. Often a dropper right at the net can win you the point. 6. Drop Volley – This brings us to the drop volley, which I mentioned before. It is simply a volley that you place close to the net. This volley works best when your opponent is behind the baseline, not fleet of foot, tired or flat-footed. However, even the fastest players can’t get a racket on a well-placed drop volley. They are subtle can be very effective. 7. Overhead Smash – If you serve and volley, you’re going to get lobbed. You have to be willing to hit overheads and work on that part of your game. 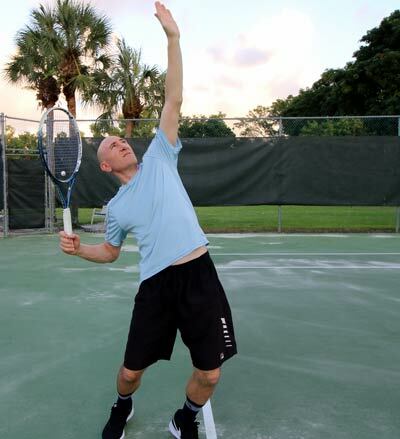 When an overhead is hit, turn to your side and get your racket into the “trophy” position. Use proper footwork to back up and when you set, place your weight on your back foot. When hitting the overhead, try to transfer weight onto the front foot. Keep in mind you need to have some racket speed to hit a decisive winner, though placement (with a slower struck shot) can be your best friend on an overhead as well. Where Do I Place My Volley? Location # 1: Behind – The first location is behind your opponent, out wide. From your perspective, you’re volleying to the left of your opponent. Location # 2: At – The second location is directly at your opponent. This sounds like a bad idea, but it can work great if you hit a fast-paced volley to an opponent who has returned from out wide. Location # 3: Ad – The third location is to the open ad court. Location # 4: Drop – The fourth location is a drop volley close to the net. Always return to the ready position after hitting a volley or an overhead. It’s important you get right back into the ready position as soon as possible. Not doing so is the most common cause of missing the net shot. After getting back to the ready position remain alert. Stay on your toes and look like you are ready to move anywhere to hit the ball. This alone will intimidate your opponent and make him miss more often. I find the opposite to be true. If you stand straight up and flat-footed, your opponent will have a much easier time passing you. Never assume the point is over until it’s clearly over. I see net players often caught by surprise when the opponent hits yet another groundstroke or lob, forcing them to hit a ball when not ready. Play the point until the end. Try to anticipate where your opponent is going to hit the ball by watching how he sets up. Often you can tell if he is going to hit a hard groundstroke or lob in this way. Sometimes you can anticipate direction as well. Learn to have a good eye. This means to be aware when a return might be going out or long. 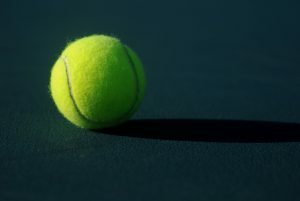 If it’s going out, just let the ball go without touching it. If you are not certain, I recommend you hit it. You will soon develop a feel for where the ball is going. If you’ve read this far, congratulations. You’ve learned a lot of information on the serve and volley game. No doubt, these tips will benefit you for the rest of your playing days. Let’s sum up what we learned and continue on. We saw that a good serve is essential if we want to use the serve and volley game. We have three different serves to choose from. We have three different zones we can serve to. Once the serve is made and we run in, we can either split step or continue running and use the flowing volley. The path we take into the net is determined by where we serve the ball. If our first volley is hit at us, we can choose four different locations to place the ball. The type of return we receive (varying height, pace and spin) will determine which volley to use from one of the seven different volley types. I think that’s a pretty good summary of how to look at the serve and volley. There are still a few more points of info to discuss. I’ll try to word them as briefly as possible. Let’s take a look at our specific options for the volley in each case: if you serve out wide, into the body or up the middle. 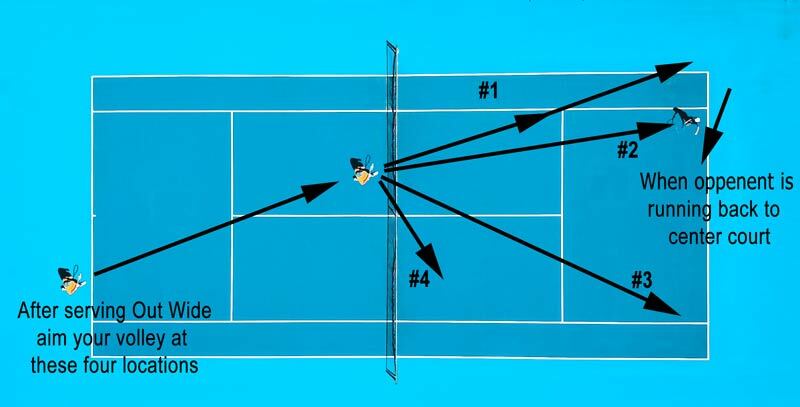 If you serve out wide and receive a return to the middle of the court, you have all four options for where to place the first volley. Location # 1: Behind – This is a volley behind your opponent, which is out wide again. Keep in mind we’re taking a bit of a chance here by volleying near our opponent. How is this location effective? If your opponent is off the court he’ll immediately try to recover to the middle of the court after making his return. You’ll know he’ll do this because his entire court is exposed. You then volley behind him so that your shot is in the opposite direction of his momentum. This makes it very difficult for him to hit back. After you volley here, slide over to your left a bit to cover anything down the line – just in case your opponent hits a forehand. **Helpful hint: This location works especially well against fast players. Slower players or lazy players tend to linger outside the court, making it difficult to hit behind them. In that case, simply hit to the open court to easily win the point. Location # 2: At – Firing a volley directly at my opponent can work because I know my opponent will likely move to his left (my right) after returning out wide. My goal on this volley is to hit a fast-paced shot right near his feet. As the opponent will be on the run, he won’t be able to set up in time to hit a good passing shot. This also catches a lot of players off-guard because they are not expecting a volley right back to them. Location # 3: Ad – Volleying to the open ad court makes sense if your opponent is off the court on the deuce side, as he may be after a serve out wide. If you hit a low, hard volley, you should win the point without your opponent getting a racket on the ball. But if hit too soft, then a fast opponent may return your volley. Remember, the opponent is anticipating we will volley to the ad side. If he has the chance to recover, he’ll be sprinting in that direction. Still, it’s the most logical place to hit and quite effective. I use this location when my opponent is way off court or when I want to fatigue him. Location # 4: Drop – I would suggest dropping the volley over the net to your right, the furthest location from your opponent. But really, this is such an effective technique it will work anywhere close to the net. The key here is to have soft hands and make sure you have a lot of “give” on your racket. If you hold a firm grip, hit the ball too high or too deep, your opponent can run in and easily put the ball away. I use the drop volley around 10-20% of the time when playing singles. In doubles, it’s a little tougher because there is another person at the net. When you serve to the body and receive a return, most likely your opponent will remain still. As a possibility, he may move slightly to his left (to the center of the court). We will need to see exactly where he is before hitting our first volley. 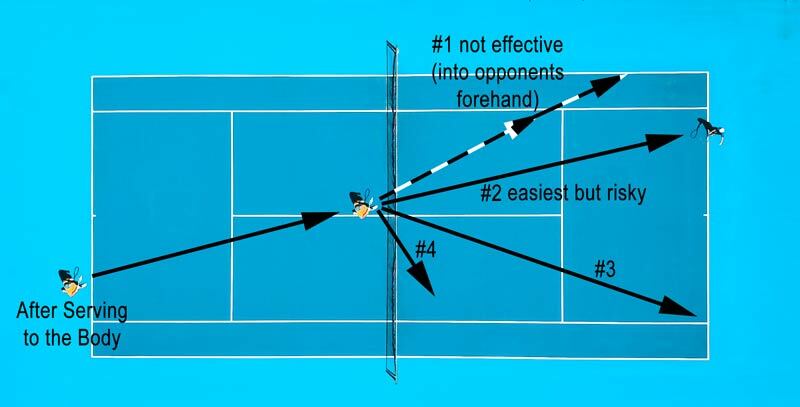 Hitting out wide to our opponent’s forehand is not preferable here, so it limits us to three locations. Location # 2: At – We can direct the ball right back at our opponent. This is the safest volley to hit for us, because we’re hitting cross court. But our opponent has a great chance to hit back the ball unless we completely jam them. I would recommend hitting to the two other locations first. Location # 3: Ad – The third location is to the open court on the ad side, preferably close to the sideline. Since our opponent is not off the court, he might be able to get to this volley if not fast-paced or angled off enough. So be ready for a second volley. Remember, your mentality as a beginner or intermediate player should be that the first volley sets up the second volley for a put-away. Location # 4: Drop – The fourth location is close to the net using a drop volley. The drop volley can be effective anywhere your opponent is, as long as he is returning near the baseline. I should mention that you can try angling off a volley to your opponent’s deuce side. However, beginner and intermediate players might find that a challenge. You’ll also be hitting dangerously close to the sideline. Your best chance to angle off the volley to this area is by using a drive or hard punch volley. Anything less and you are hitting into your opponent’s forehand. A good serve up the middle will stretch your opponent out and put him near the middle of the court. I would not advise you go straight back to him though. From the center of the court there are too many options. He can pass you on either side, lob you or even hit a dipping shot at your feet. Location # 1: Behind – Out wide to the deuce side. This will make the opponent scramble to his right to hit a forehand. The benefit is you drag him away from the center of the court to set up the next volley, which will be to the far ad court. The danger here is in not hitting a good enough volley. If not, then you are hitting right into your opponent’s strength, which is his forehand. It’s important that you move a few steps to your left when hitting here so you can cover the down-the-line shot. Location # 3: Ad – To the far ad court. This will put the volley on your opponent’s backhand side. He’ll have to scramble to hit a backhand pass, which is much tougher than a forehand. This is a safer bet for us and better than hitting to the deuce side (location # 1). After hitting this volley, scoot to your right a few steps. You’ll want to cover any possible down-the-line backhands (which it would come down the right side of your court). Location # 4: Drop – Near the net. Yup, another drop volley. They’re always effective and can really dishearten the opposition. I used to play against a great net player named Seth who had tremendous drop volleys and overheads but not much in between. He could “deaden” almost any groundstroke and place the ball within two feet of the net, where it would die quickly. There’s just no chance to return a volley like that! What Happens After The First Volley? You’ll either end the point with the first volley or not. If the point continues, then hopefully you’ve done enough with the first volley to set up a put away second volley. If not, then you’re in a dogfight, as your opponent is likely scrambling around the court, desperately trying to pass or lob you. Remember to keep getting back into the ready position after each volley. Keep cool and try to anticipate where your opponent is hitting. It’s also vital that you move forward after each volley. 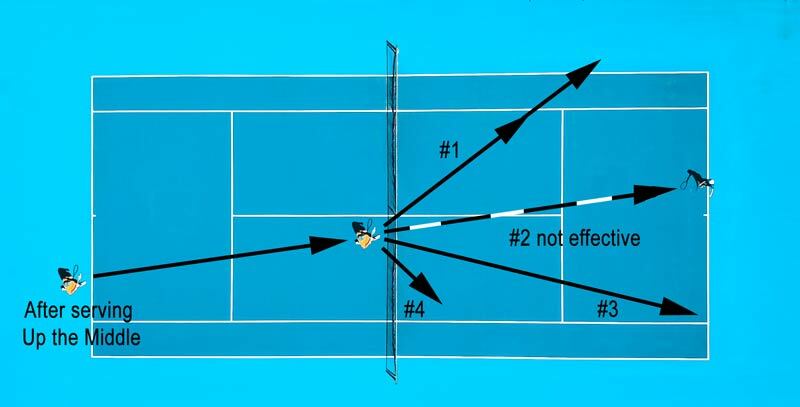 If your first volley is struck at the service line, you should be able to at least take several steps in so that you’re closer to the net for the second volley. The closer you are to net, the more angles you can cut off from your opponent. I should point out that leaving a couple of feet of space from you and the net is advisable. If you play with your nose over the net, you can be very easily lobbed. Not only that, you stand a good chance of hitting the net with your racket or body. Doing so will automatically lose you to the point. Here is one more important take away when being in a dogfight at the net. Don’t back off the net and attempt to run back to the baseline, please. There’s no time for that, and besides, that behavior is contrary to what we are looking to do here. We want to keep pressure on our opponent and end the point quickly and decisively with a volley or overhead. If it takes 10 volleys to win the point, then so be it. Keep closing in and angling off the volleys. The only time you should ever back up is when being lobbed. What About Serving To The Ad Side? You can use the same strategy of choosing which serve to use and to what location. After serving, you still follow the ball in on the same trajectories, just the reverse of the deuce side. If going out wide, you’ll need to run on the sharpest angle. If to the body, then less sharp. And if going up the middle, then you’ll run nearly down the middle of the court, with not much angle. I want to touch on each location for the ad side before ending this post. I’ll mention the most important things you need to know about serving to each zone. Again, this all assumes a righty is serving to a righty. Serving Out Wide – This is a great place to serve since the ball is being directed at your opponent’s backhand. Fast, flat serves and kick serves work great in this zone. Most likely you’ll receive back a weak return or floater. If so, don’t even worry about going behind them. Simply hit the return to the far deuce side of the court, far from your opponent. You can also hit a drop volley on the deuce side. A kick serve to this zone probably won’t get you an ace, but it will most often produce a weak return. A kick serve out wide is one of the safest plays you can make when attempting to serve and volley. 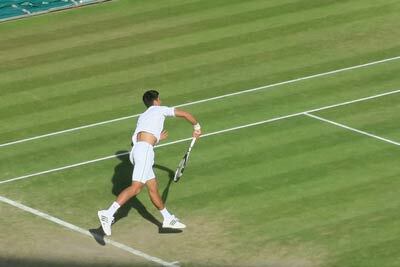 Serving Into The Body – Any type of serve (fast, slice or kick) will work in this zone. Most players prefer hitting a fast serve to the body though. Most returns that are directed into the body are weak, making a put away easy. If you receive back a medium or fast-paced return, you may have the option of hitting back to the ad side if your opponent moves to the middle of the court quickly. But most of the time I recommend volleying to the far deuce side or just hitting a drop volley. Your worst place to volley back to is the middle of the court (right into your opponent’s forehand), so try not to at all costs. Serving Up The Middle – This zone can produce a lot of aces. I believe it’s easier to ace someone up the middle than out wide, especially for club players. But, with that said, remember, you are serving right into your opponent’s forehand. For that reason, I do not recommend many up the middle serves on the ad side, unless you serve with a big kick, with a lot of velocity or have excellent placement. Let’s say you receive back a medium-to-fast-paced return. My ultimate play is to hit a drop volley on either the deuce or ad side. If you can’t do that, here are three other options. Hit a fast-paced volley out wide to the deuce side. Or, do the same to the ad side. One additional option is to hit a fast-paced volley directly at your opponent. Try to edge it slightly more to the backhand side if you can. You do this in the hopes of jamming your opponent and making him miss or send back a weak return. While this is the easiest volley to hit, you expose yourself in the middle of the net if your opponent can set up for a blast return. Before we wrap up, I’d like to say a few things about your return game. You obviously know the serve and volley can only be employed when you’re serving. But how can we be aggressive at the net while returning serve? The answer is the chip and charge. We can do this off the serve or on a groundstroke. 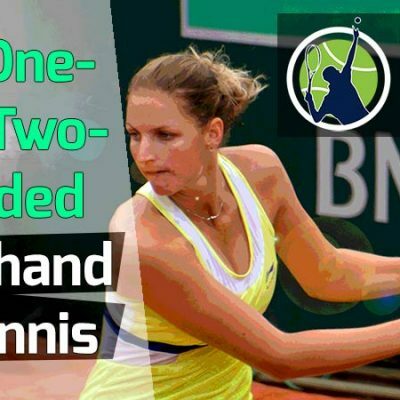 The chip is the slice, which can be done on either the forehand or backhand side. By slicing, preferably to the sidelines, we keep the ball low and make it difficult to hit. We then charge the net, following the path of the ball. This will drive our opponent’s crazy, as they at least thought we’d stay back when returning. 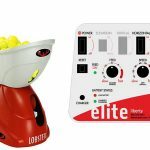 You can also come in on most well-hit or deep groundstrokes. I like to come in on a groundstroke to my opponent’s backhand. Usually, he’ll be on the run when I start coming in. Another play is to hit a looping, topspin shot to your opponent’s backhand and just come in immediately behind it. Despite returning, there are plenty of opportunities to come to net. I’m very glad you’ve come this far. Soon the serve and volley game will be second nature to you. With practice, you’ll be winning points from the net with ease. Your opponents will find you incredibly difficult to play and your doubles game will grow leaps and bounds. I want to leave you with a few more tips. I didn’t have a chance to include them earlier in the post, but nonetheless, they are important as well. When serving and volleying, make sure to use a loose grip. This gives you more snap on the serve and more feel on the volley. Practice your serve often and practice your volleys all the time. I noticed that the level of both declines if not used or practiced. Practice your footwork. Go through your serve and practice moving into net with a split step. Then practice your volley step and your move back for the overhead. Do this many times without using a ball. All that’s required is you and your racket. Watch youtube videos of the greatest serve and volley players of all time. 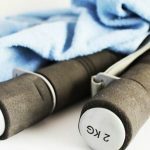 Notice how they use the techniques and strategies I discussed in this article. Watch the way they play and learn and be inspired by it. Play entire sets where you serve and volley on first and second serve. Try to chip and charge on return games. Come to net every chance you have. Do this against players lower than your level and see if you can win. The more you come to net, the more comfortable you’ll feel. If your volley game seems like it’s falling apart during a match, use the block volley until your feel returns. The block volley will put the ball back on your opponent’s side of the court and at least make him hit another shot.